This past Saturday was Rest day and I was able to trek off into the North Georgia woods with my son and part of our Boy Scout Troop’s Philmont Crew to go backpacking. We drove up to Vogel State Park, I popped in my Backpacking X DVD and pushed “play.” Our objective was to hike a modified version of the Coosa Backcountry Trail, a difficult loop trail that climbs Coosa Bald (4,280′) and Slaughter Mountain (4,338′), then descends to Slaughter Gap at mile 10. The boys handled all the miles and climbing well. I was pleased with my results as well. A big part of the reason I started P90X was to rejuvenate my backpacking and hiking career. And so it has. The first thing I noticed since I was last out a couple of months ago was that my backpack hip belt (size medium) is now tightened to the max in order to support the pack on my hips. That was very tangible evidence of reduced gut size. The next thing I noticed, and enjoyed immensely, was that I was bounding upward on the slopes of Coosa and Slaughter Mountains. Everything felt great: breathing, stability, strength. When you aren’t suffering due to lack of conditioning, you can literally stop and smell the wild roses, take in the views and rejoice in the beauty of the mountains which are on fire this time of year with flaming orange azaleas. 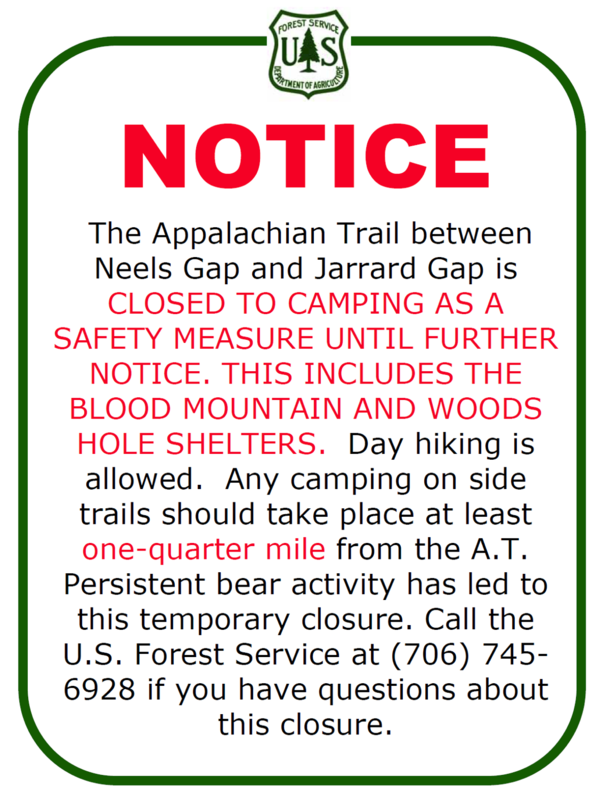 By camping in Slaughter Gap, we stayed outside the area of the AT where there is currently a camping ban in place because a habituated black bear has been reeking havoc, raiding campsites, food caches and defeating bear bags. It’s unusual in Georgia to have a bear that knows how to get a bear bag by going for the supporting line on an adjacent tree. This bear, earlier in April, actually entered the Blood Mountain shelter–through the window–when it was full of AT thruhikers, to get at a stash of food. That’s what a habituated bear is. A bear that associates people with food and isn’t afraid of people. Such bears often wind up dead because they won’t unlearn this association. Last year the USFS attempted to find and kill it, but failed. While we were outside the zone where the camping ban was in place, we were nearby, about half a mile away. And I was legitimately concerned that this bear might not be able to read and would be unaware of our “rights” to camp at Slaughter Gap without incident. We used it as an opportunity to educate the boys on how to camp safely in bear country and took extra care identifying all smellables and hanging them high and away in a (hopefully) secure bear bag. As it turned out, all was good and we awoke the next morning with our campsite and bear bag intact. The next morning, we headed off the Coosa trail at Slaughter Gap and onto the Duncan Ridge Trail which connects to the Appalachian Trail. The intent on Day 2 was to add some easy miles and jump off the AT, hike the Slaughter Creek Trail, turn left onto the Jarrard Gap Trail, reconnect with the AT, ascend Blood Mountain and descend to Neels Gap. Aside: who in the Georgia tourism marketing department came up with these names? Slaughter Mountain & Gap, Blood Mountain… Toss in some bear activity. Not very inviting, people. Well, as it turns out, we hiked a severely modified version of the Day 2 plan. You see, there was a bit of a mutiny staged by the boys who, having just hiked 10 miles with over 1 mile of total elevation change the prior day, were not keen on adding additional miles to Day 2 solely for aesthetic reasons. Unfortunately, in Scouts, we teach the boys how to read a map and they immediately picked up on the fact that they could avoid the entire Slaughter Creek, Jarrard Gap, AT Loop AND the ascent of Blood Mountain. To do so, they just needed to Hike the Freeman Trail from Bird Gap, go around Blood, reconnect with the AT and descend to Neels. So we got back earlier than planned, safe and sound. We were fortunate to have perfect hiking weather, cool and in the 60’s. It was a very special treat for me to spend time with my college-bound son, Daniel. This entry was posted in Backpacking, P90X-Insanity Hybrid, Round 2 and tagged Appalachian Trail, Backpacking, Bear, bear bag, Blood Mountain, Coosa Backcountry Trail, Coosa Bald, P90X-Insanity Hybrid, Rest, Slaughter Mountain. Bookmark the permalink.